Nosebleeds (epistaxis) may seem frightening but are usually not dangerous. 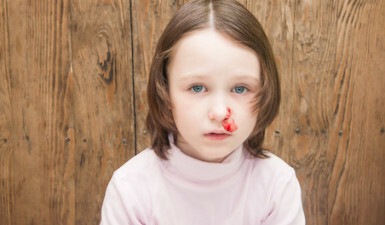 Nosebleeds are fairly common in children, especially among those who live in dry climates. Nosebleeds are also common during the winter when dry heat inside homes and buildings can cause drying, cracking, or crusting inside the nose. Most nosebleeds in children occur in the front part of the nose close to the nostrils, where there are many fragile blood vessels that can be damaged easily. Children usually outgrow the tendency to have nosebleeds during their teenage years. Pinch the nostrils together for five to 10 minutes without checking to see if bleeding has stopped. Do not pack your child’s nose with tissues or gauze. How can I prevent nosebleeds in my child? Use a cool mist humidifier in your child’s room at night if the air in your home is dry. Be sure to follow the manufacturer’s advice for cleaning the humidifier so that germs and mold do not grow in it. Use saline (salt water) drops or a saline nose spray as directed by your child’s physician. See your child’s physician for treatment of allergies that may contribute to frequent nosebleeds.